Nevertheless, green beans and pasta can actually get along famously. 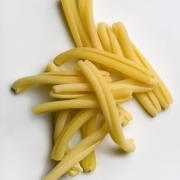 There is a type of pasta (see photo left) variously called caserecce, gemelli or strozzapreti, which have something of a similar shape to green beans, so they pair nicely. And green beans get along famously with tomatoes, as in the classic fagiolini in umido, so it doesn’t take too much of a leap of the imagination to put the three elements—pasta, green beans and tomatoes—together for a tasty treat. Make a tomato sauce beginning with a soffritto of chopped onion sweated in olive oil along with a bit of garlic. When the onion is translucent and soft, add some crushed canned tomatoes (or chopped fresh tomatoes in season) along with a good handful of fresh mint leaves (or basil) and, if you like, some red pepper flakes—not too many, just enough to add a hint of spiciness. Allow the tomatoes to simmer until reduced to a saucy consistency, about 10-15 minutes. Meanwhile, parboil your green beans, trimmed and cut into sections about the same length as the pasta, in salted water until cooked just crisp-tender, and add to the tomato sauce to simmer and insaporire until the beans are quite tender. In the same water in which the beans cooked, cook your pasta al dente and add to the green bean and tomato sauce. Mix well, let it simmer for a minute or two for the flavors to meld and the pasta to absorb a bit of the sauce, then serve. If you like, fold in some pecorino cheese that you will have grated with the large holes of a four-sided grater, so they emerge as long strips, about the same length as the pasta and green beans. Caserecce are really the perfect pasta shape to go with green beans, and are fairly easy to find, but you can use other ‘semi-long’ pasta shapes such as trofie, sedani or stringozzi. Also note that, confusingly, the term strozzapreti is used to describe a number of different types of pasta, so check the shape before you buy. If you are pressed for time, you can also cook your green beans together with the pasta rather than separately, then add both to the tomato sauce. Your Pasta and Green Beans will be slightly less ‘beany’ (since the green beans will not have time to lend their flavor to both the cooking water and the sauce) but still quite good. We finally made your recipe last night after waiting for the first of the season, John Giusti Farms, Half Moon Bay, CA- green beans. To do these very finest, gorgeous green beans the justice they deserved, we used Casa Barone la conserva tradizionale Cherry Tomato Preserve (www.casabarone.it), 4-year aged Moliterno Pecorino (Basilicata) and opal and Genovese basil from our garden. With all those fine ingredient, it’s no wonder you enjoyed the dish. Thanks so much for your comment, guys! For the sauce I used 3/4 of a can of REDPACK crushed tomatoes and it was the perfect amount of sauce for my taste and made for a quick recipe. That’s awesome, Dolores! So glad you enjoyed the dish. This is sending me to the market for beans! This looks like a wonderful dish Frank. Bravo! Love your comment about measurements. Find it ever so hard to write recipes with measurements. 100 per cent of the time I follow my taste and instinct. This is the perfect dish for me, basic Italian flavours, good seasonal vegetables and pasta, cant get any better than that!!! What a delicious looking pasta dish. That would be great for our meatless night. You have saved me with this! I could not figure out what to serve for supper and was getting desperate — thanks!! I never had pasta with green beans, but I am intrigued now, this sounds like something I would love. This looks delightful! I really need to try making my own pasta one of these days. Looks perfect any night of the week!